Senator Ben Sasse posted this inspiring video on social media today. It’s a much-needed blast of American spirit, to cleanse the air of the latest Twitter SPIN battle. While the American media and President Trump fall into another SPIN “shithole”, today’s blog post is not going to be about politics. Some Democrats, after a meeting with Trump, decided to attempt another #Resist Trump takedown spin effort. The mainstream liberal media went into full hysteria mode last night… again… about “Trump is a racist”. I had been working on a junk journal last night and didn’t look at Twitter until close to midnight. It took me about 30 seconds of scrolling through journalists’ tweets to assess a full-blown #Resist SPIN attack underway. By this morning, a great deal of the liberal Twitter shitstorm over “shitholes” was so over-the-top, that it’s clear they may, once again, end up bolstering Trump rather than taking him down. Many of the #Resisters, who pretend to be objective journalists, sound like hysterical lunatics. The altered book junk journal I am working on is for my youngest daughter. 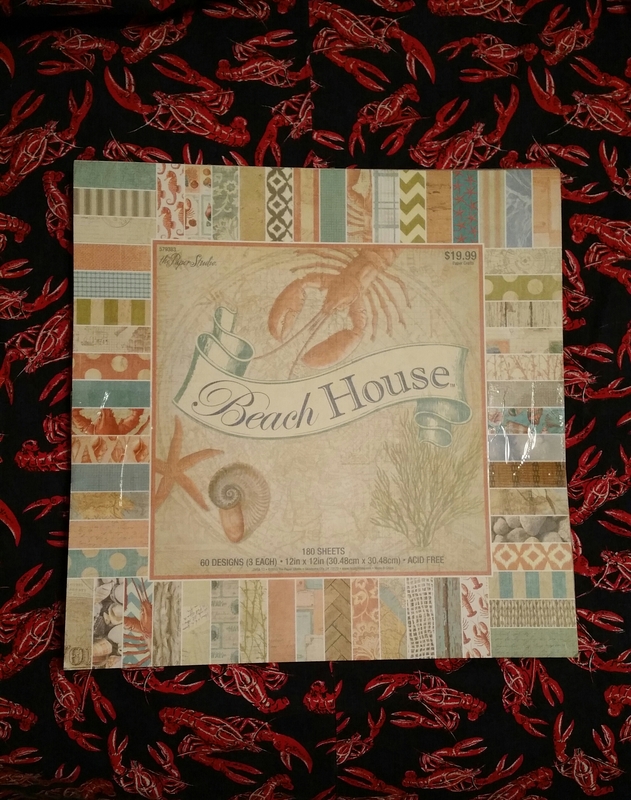 I found this lovely scrapbook paper at Hobby Lobby a few weeks ago, when they had this brand of paper on sale for 50% off. The background is actually a skirt my youngest daughter sewed in her early teens. She loved this dark navy fabric with the lobster print, even though I was trying to steer her toward pretty pastel colored fabric. We found an easy skirt pattern and she sewed several pretty floral print skirts and this lobster print skirt, needing very little assistance, once she did a little bit of practice sewing on scrap fabric to get the hang of machine sewing. I came across this skirt in the spare bedroom closet recently and my mind flew to thinking it would be great to repurpose it as a junk journal cover and possibly use more of it to make a tote bag for her too. The picture above is one of my favorite childhood books, that I came across looking through old books for junk journaling. It’s pretty beat-up and has pen scribbles on it, that I know I didn’t put there. I know this, because I wrote my name inside the front cover of my books and did not scribble or write in them. When I got to college and first observed the habit of using highlighter markers in your textbooks, well, I was appalled that people would deface their books like that. I never got into the habit of “highlighting” or writing in my books and I tried to take good care of my books. And of course, bending down page corners to mark your place in a book should be punishable with a good smack upside the head. Book collecting (hoarding) is a lifelong habit, that I will never quit, although I’ve tried to read more kindle books and buy less actual books in recent years. Sadly, my same book hoarding habits easily transferred to digital hoarding too. My bookmarks always are out of control, same with the other crap I download and my Pinterest has over 200 boards and over 12,000 pins… I have pinned way more recipes and craft projects than I can ever use, but I still keep pinning more. Anyone else have this “hoarding” problem with digital information? One of my happiest memories of my early years of school was receiving my Scholastic Book Club flyer from my teacher, pouring over every book listing, then compiling my “wish list”. Usually my list contained almost every book in the flyer. My mother would give me money for books and then I had to sit there and decide which books I wanted the most, to fit my small book allowance. 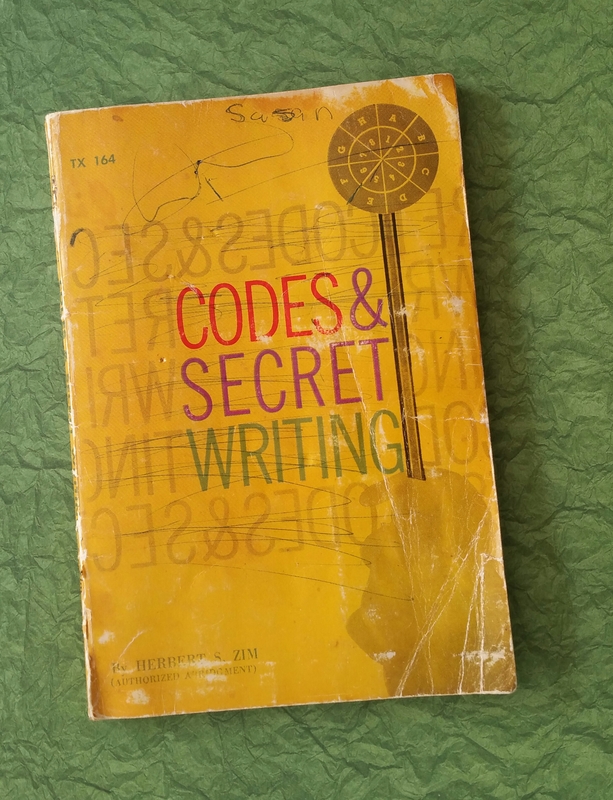 I bought Codes & Secret Writing when I was around 10 years old and it fueled my interest in cryptography. Learning about its use in warfare led to my interest in military strategy. I also liked reading mystery genre stories, as a kid, which often involved strange happenings or odd people rather than the more common adult crime detective mysteries. Truth be told, I was never very good at codes and ciphers and I found military strategy much more my cup of tea. Another of my favorite childhood book genres was biographies of great or famous people. I still like reading about important people in history, but I prefer a narrower selection now, opting to read biographies about people whose lives and/or ideas impacted history in some profound way. I also moved toward trying to read the person’s own writings and letters whenever possible, rather than relying on a biographer or historian’s assessment. This habit grew out of observing that too often historians seem to work from having already decided on the character of the historical figure they are writing about and using their research to cherry pick historical documentation to bolster their preconceived character assessment. I honestly believe that at the core of the perceptions of Grant and Lee lies a class bias, where Lee obviously had the pedigree of a Southern aristocrat and Grant came from a hardscrabble working class background. It’s much easier to place Lee, with his impeccable personal appearance and stately bearing, as a majestic war hero on a statue than it is Grant, with his rumpled clothes and lack of a commanding presence. I wish Trump and his enemies waging these Tweetstorm battles would call a truce to this destructive information war, but each side believes they’re “saving” America, even though their SPIN battles deepen the partisan divides in America, incite rage, and fray the bonds of civil society. You don’t need to understand any secret codes or ciphers to see how damaging SPIN is to America, all you need to do is listen to the Trump vs. the Media news a few minutes a day. Hmmm LB. You do have the knack for surprising me. I don’t do Twitter myself but, I did take notice of Malcolm’s posting a link to a video featuring some Twitter execs (?) using a variation of precisely the same characterization that’s got the entire (seemingly) media apparatus’ knickers in a twist. What is it they say about “sauce for the gander”? Need I answer to that? I don’t understand what shadow-banning is exactly and I don’t trust project veritas as a source, however… Um, Twitter isn’t alone among social media platforms at trying to find ways to marginalize conservatives. I joined Twitter in 2014, but thought it was stupid, so I lost interest in it very quickly. Facebook is stupid too, but I enjoy seeing my friends post pictures of their grandkids or my kids post photos and that sort of stuff. I use Pinterest as my personal recipe and craft idea files and don’t really do any socializing there. When Trump’s Twitter became a part of the 2016 campaign, I began to follow Trump and hundreds of journalists on Twitter, to try to understand why Twitter mattered in the presidential election. The media harps about Trump’s Twitter use, but the thing I realized was the media and political pundits live on Twitter more than Trump does and Twitter is where the liberal media spin cycles are now generated. Since I’ve been “pondering” SPIN since 1992 and following its evolution, you can watch spin cycles form and spin out of control within hours on Twitter, as journalists and pundits furiously retweet breaking news (often just rumors about Trump). The Twitter format allows them to sit on their butts and just “retweet” each other’s gossip, often without any fact-checking. In the early days of the Left spinning, they had to rely on getting their mouthpieces on cable news to spew the talking points they sent around and also to get friendly media regurgitating their talking points. Now, they all sit on Twitter and retweet. Trump’s tweets seems to be mostly his reacting to mostly spin that moves from Twitter onto the cable news. TV cable news seems to be his primary news source for assessing the information war being waged against him, but he then often goes on Twitter to fight back. He knows his enemies, in the media and Left, follow his Twitter 24/7. I could, I suppose but, its probably better for my nerves for me to just keep hanging around here. The guy I mentioned earlier told me the tale of how he lost a keen e-friendship in a mere 140 characters. Trump it would appear (along with perhaps 70% of the media) appears to me to be doing the same thing except that, we’re gonna have to endure … belay that – not “we’re” I mean somebody[s] is gonna have to endure a heckuva lot more than that mere. Our sleep cycles being so outta whack since; I’ve only now gotten my first coffee but I’d advise waiting abit more (your’s is only the second site I’ve landed on). There has been a precedent where shenanigans were a feature – but at that previous instance the Senate Select Intelligence Cmte. : 101st Congress July 1989, CISPES Investigation; only affected lower tier and not upper management. Of course we have seen the weaponization of “other government agencies” quite recently so perhaps … TV people seem focused on a “looming” shutdown so … patience ought probably be the order of the day. I actually came for the journal and enjoyed your perspective on politics. I almost always find myself apologizing for what they do in Washington. Sort of sad since we pay their salary and would not act like that.